Western blot analysis of extracts from IGROV-1, Hep G2, and 293T cells using L-asparaginase/ASRGL1 Antibody. 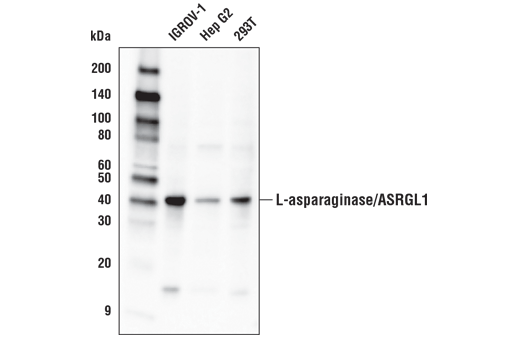 L-asparaginase/ASRGL1 Antibody recognizes endogenous levels of total L-asparaginase/ASRGL1 protein. Polyclonal antibodies are produced by immunizing animals with a synthetic peptide corresponding to residues near the carboxy terminus of human L-asparaginase/ASRGL1 protein. Antibodies are purified by protein A and peptide affinity chromatography. L-asparaginase (ASRGL1) catalyzes the conversion of L-asparagine to L-aspartate. Research studies have shown that intracellular asparagine can suppress apoptosis in a large number of human tumors (1). In addition, acute lymphocytic leukemia cells frequently depend upon serum asparagine for their viability, as they lack asparagine synthetase (ASNS). Deprivation of asparagine by L-asparaginase has therefore been developed as a therapeutic treatment for acute lymphocytic leukemia (2-3). In KRAS mutant non-small cell lung carcinoma (NSCLC) cells, PI3K/Akt signaling was shown to be required for ASNS expression, suggesting combinatorial Akt inhibition and L-asparaginase treatment as a therapeutic strategy for NSCLC (3). Research studies on a breast cancer model have furthermore shown that restriction of asparagine can suppress cancer metastasis (4). Zhang, J. et al. (2014) Mol Cell 56, 205-18. Gwinn, D.M. et al. (2018) Cancer Cell 33, 91-107.e6. Knott, S.R.V. et al. (2018) Nature 554, 378-81.